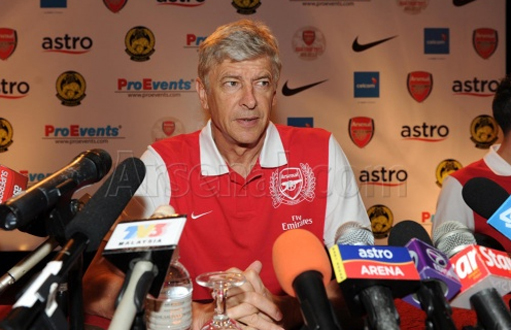 With Arsene Wenger, Robin van Persie and Bacray Sagna speaking to the media yesterday along with the AST meeting last night, there is a lot to get through today. I'll start with the manager who was in a defiant mood when talking to the media about the next season at the club. If you read the Guardian's Q&A from the press conference you get a real sense that the manager isn't talking rubbish when he says that Cesc will stay. Of course we know should Barcelona meet our valuation of the player he'll be sold, but it appears we're a long way off from that happening. One of the manager's stand out quotes for me on the situation as a whole is when Wenger talks about Arsenal being a big club. "I believe for us it is important the message we give out. For example, you talk about Fabregas leaving, Nasri leaving. "If you give that message out, you cannot pretend you are a big club, because a big club first of all holds onto its big players and gives a message out to all the other big clubs that they just cannot come in and take away from you. "We worked very hard with these players for years to develop them, and now it's a time for us to keep them together." The problem we have, especially with keeping hold of Nasri for the final season of his contract without him extending it, is that next summer he'll walk away from the club for nothing. Arsenal cannot afford for that to happen - as Tim Payton of the Arsenal Supporters Trust has pointed out. If Nasri is not prepared to extend his deal he must be sold. For me, there is no question that the manager realises the importance of the season ahead and will want to keep his squad together. But for the long term future of the club, it is important we sell Nasri if he won't commit. Alex Ferguson has already said he thinks it unlikely the Frenchman will end up at Old Trafford, so it points to the deal talked about last weekend with Manchester City which we'll look to do if Wenger can't persuade Samir to resign. "I think Cesc has always been torn between his love for Arsenal, that I feel is really genuine, and, as well - and what you can understand -the desire to play for the biggest team in the world. I think both exist in his head. "I am confident, because I hope he will see that there will be no greater achievement for him in his life than to lead this team to success and that it will not be the right period for him to leave." I believe the manager is staying as strong as he can on this one. The disrespectful bids from Barcelona have helped our cause and shown Cesc that his boyhood club don't want him that much. I don't think you can doubt our captain's commitment last season, he was one of a handful of player you can actually say give a damn about the club. It's not been good PR for the club that Cesc has remained in London. Seeing that he was just in Bali three weeks ago with the same hamstring injury he's got now, I don't see why he couldn't have gone on the flight. Especially considering talk that he'll resumed full training today. Robin van Persie has been talking about how integral Cesc is to the team and I'm sure that both Robin and Cesc would love to win something with Arsenal. A couple of transfer rumours. The Daily Mail again link us with a move for Craig Gordon. Whilst The Sun say we're after 16-year-old Mexico whizkid Carlos Fierro. The main thrust of the AST meeting was to discuss the results from its annual membership survey. There is more information on that on the AST's website. These results will now be fed back to every man who sits on the board in order to influence their future decisions. The Daily Express have a run through of all the facts and figures. - We sell to buy in the next three years unless we pay more for our tickets and/or perform better in the league or Champions League (finish higher/go further) because of our commercial deals aren't of the level of MUFC. - Failing to qualify for the group stages of the Champions League could cost the club £25m. - The Transfer Proceeds Account has roughly £30m in it and this has to be spent on signing new players and uplifting the contracts of current members of the squad. - If we sold some of the younger players who aren't going to make it at the club, we'd be able to spend our cash better. - Arsenal's wages are spread throughout the squad and there aren't the incentives for younger players to try to get a higher wage through performance as there are at other clubs. - Arsenal pay Aaron Ramsey three times as much MUFC offered him. They offered him a junior contract but AFC offered him a first team player's contract on day one. - Season tickets for next season are sold out. - Just year one in four people took up the option of a season ticket offered to them from the waiting list. - Club Level sold out early June. - Queensland Road property deal has been completed and will raise the club £25m. - Red & White are 400 shares short of 30%. There are only 2,800 shares not owned by Kroenke or R&W. - If R&W reach 30% they can have access to the books and can reveal details about player's contracts, wages, club cost etc. - Arsenal no longer have a board. Members of the current board - apart from Kroenke - have no more share holdings than members of the AST and Fanshare. - Current board are understood to have a committment from KSE to keep their positions for a year following the takeover. - Gazidis was interviewed by Wenger for his job. Doesn't have the same dynamic as other PL CEOs with their manager. - The threat from the American owners is to lose relegation. - Emirates Cup is unsustainable and it will probably be the last one this season. - Asia Tour will be making the club a small profit. The board of Arsenal Fanshare stopped purchasing shares during the takeover period but now have found some supporters who are willing to see to Fanshare rather than take the cash of Usmanov or Kroenke. If you're not already a member of Fanshare and live in the UK, it's well worth a look.